Miltiadis (Miltos) Moumoulidis is a phenomenal musician, one of the greatest masters of his art, and one of the world’s best clarinetists. Since 1991 principal clarinetist of Cologne New Philharmonic he is now a professor at the University of Macedonia GR in Thessaloniki, Greece. On this album, he gives stellar performances of Mozart's Clarinet Concerto. Volker Hartung and the Cologne New Philharmonic Orchestra are accompanying him. 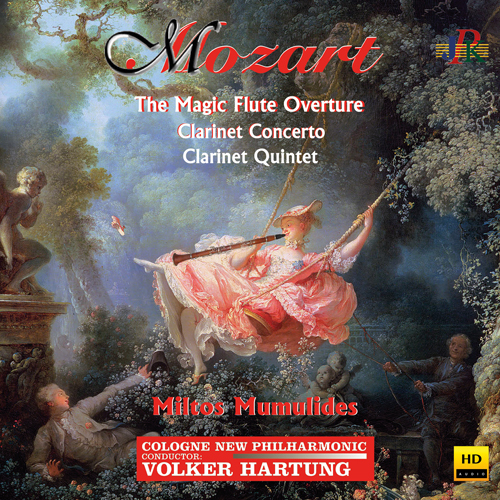 Also presented here are a lively recording of Mozarts Clarinet Quintet with soloists of the orchestra and the „Magic Flute“ Overture. Davide Toso plays 1st Violin, Christine Kaulbach, 2nd violin, Pavel Ulanicki, Cello, and Volker Hartung the viola part.